Allegedly nicknamed "King Monkey" by Dodgy's drummer Mathew Priest. Brown is well known to standout from the crowd and had his own unique style, whilst in The Roses he used to often wear big baggy flares and his landmark t-shirt with banknotes on. He now has a more casual look: Adidas Jackets, tracksuit bottoms, army trousers and a pair of shades. He is also recognisable for his varying hairstyles including: Blonde mohawk (early Stone Roses days) short (also early Stone roses days) undercut (similar to John Squire's) Big Hair (1989) bob cut (early 90's) Skinhead and his most well known hairdo long and shaggy with a fringe. He has had two top 5 singles in the UK, My Star and Dolphins Were Monkeys. In 2005 he collaborated with Noel Gallagher from Oasis for the track Keep What Ya Got. He has also collaborated with U.N.K.L.E. on two tracks, 1999's Be There and Reign in 2004. 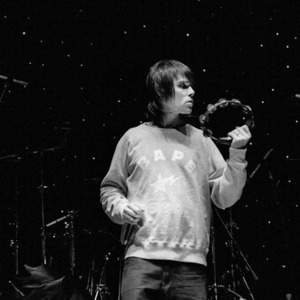 Recently Brown has started playing Stone Roses songs during gigs, fuelling speculation that a reunion may be on the cards. But In September 2005 Ian appeared to rule out a Stone Roses reunion saying "there's more chance of me reforming the Happy Mondays than the Roses". Happy Mondays in fact have reformed, but yet Brown appears pessimistic about a likelihood of any reunion. A reunion would also hinge on the co-operation of Roses guitarist John Squire who recently stated his desire to turn his back on music and focus on painting. His latest album, My Way, was released September 2009.